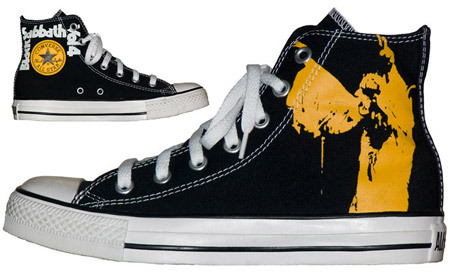 Trendhunter.com reports: To simultaneously honor the gods of heavy metal and commemorate the 100th anniversary of Converse shoes, the iconic shoe company will release three pairs of BLACK SABBATH-inspired shoes in time for the holiday season. The first pair of Converse Chuck Taylors is inspired by the cover of BLACK SABBATH's 1972 album "Vol. 4". 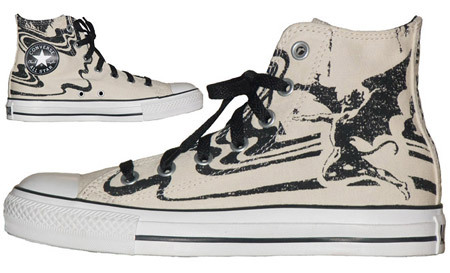 The second pair of Chuck Taylors features a distressed print to emulate an old, worn tour tee shirt, and is inspired by the design on an actual BLACK SABBATH 1978 World Tour shirt. 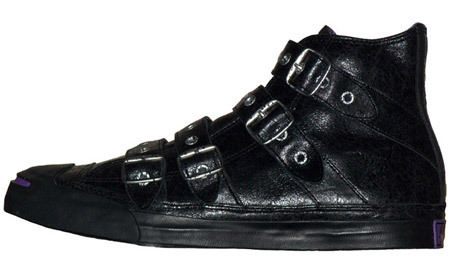 The final pair is a leathery tribute to heavy metal, with purple accents on a black leather pair of Jack Purcells. For more information, visit www.converse.com.